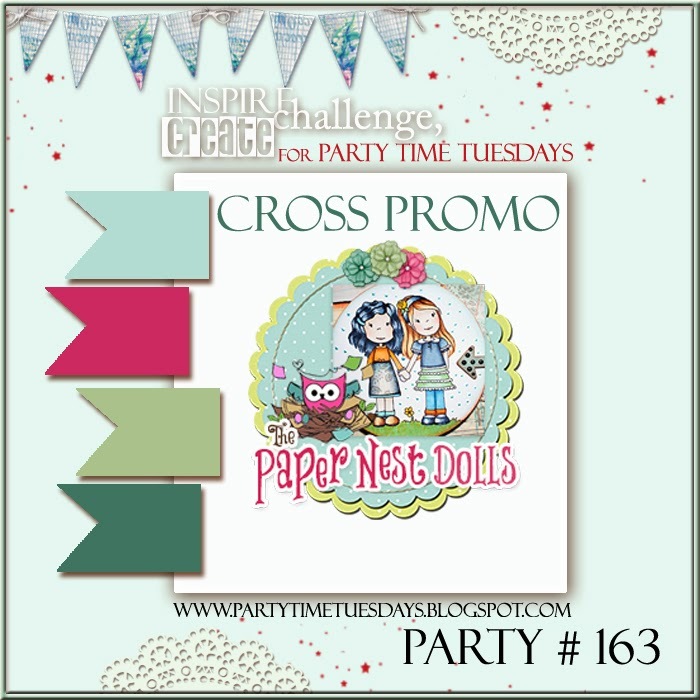 Party Time Tuesdays: Anything Goes with The Paper Nest Dolls. Anything Goes with The Paper Nest Dolls. Hello to all of our Party friends! Did you hear? PTT is having a Design Team Call! How would you like to have to focus on you as an artist instead of always focusing on product companies? Well then, this DT is for you! Click here and read all the details about our UNIQUE Design Team! Today's Cross Promotion Challenge is at The Paper Nest Dolls. There challenges till the beginning of April are ALL Anything Goes. So there you have it....craft anything your heart desires. Paper Nest Dolls are hand drawn illustrations by Christine Young. She turns her original artwork into stamps for stamp lovers everywhere. The images are named and inspired by her children. Check out The Paper Nest Dolls Store here and blog here. Click here for the Anything Goes Challenge!